Modern medical authorities say that gout occurs when urate crystals accumulate around your joints, causing inflammation and intense pain. They claim that urate crystals can form when there's a high level of uric acid in the blood. Some say that it is caused by unbalanced diet, stress, or genetics. So what is it really? Normally, uric acid dissolves in your blood and goes through your kidneys and excreted through your urine. However, when your body produces high levels of uric acid and your kidneys excrete only a small amount of uric acid, then the uric acid can build up. This will lead to the formation of urate crystals in the joint or surrounding tissues, which cause pain, inflammation, and swelling. Doctors state various reasons for the cause of gout, but did you know that urate crystals are byproducts instead that is caused by the disease? According to medical books, a substance that causes gout is uric acid, which is present in the blood as a breakdown product of protein metabolism. However, lack of exercise, excessive drinking of alcohol, obesity, stress, etc., can increase the concentration of uric acid in the blood, which leads to “hyperuricemia”, the underlying cause of gout. The accumulated uric acid forms sharp, needle-like crystals in the joints. This results to sudden extremely painful attacks that can last from a few hours to a few days. As mentioned previously, some doctors say that stress can cause gout. Others say that lifestyle, diet, and genetics are factors that can cause gout. There is no definite answer at all. Since medical scientists cannot find the cause of gout, they cannot find its cure, too. Although cure for gout in today's modern medical science is not yet available, remedial treatments such as consumption of tomato, peach, apple, orange, grape, and fig, can help alleviate the pain. 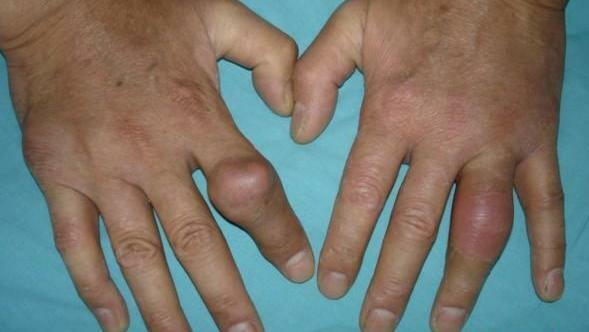 So, What Is the Cause of Gout? The cause of gout cannot be explained scientifically or clinically, because it is caused spiritually (if you do not believe it, please just disregard this article to avoid any further confusions). There are thousands of things that cannot be explained in science alone, but there's a possibility that it can be explained spiritually. In my next article, I will explain many diseases that modern medical science failed to find their causes and cures, including many diseases that were disregarded. I will also explain how many hopeless patients were miraculously saved by simple prayers of spiritual healers, especially in primitive countryside of underdeveloped states. What spiritual healing is and what and how spirit works will also be answered. Do you know that gout can be treated well by the PYRO-ENERGEN in a very short period of time? In some cases, pain can be eradicated in a matter of seconds. Can you believe that? Try it and you will be convinced as well! 1. "How to Get Rid of Chronic Gouty Arthritis"
2. "High Uric Acid Levels Can Lead to Heart Attack"